Peel beets and dice into bite size wedges. In a bowl, and lemon juice and drizzle a generous amount of extra virgin olive oil over the beets. Add chopped garlic. Toss to coat beets. Season with sea salt and black pepper. 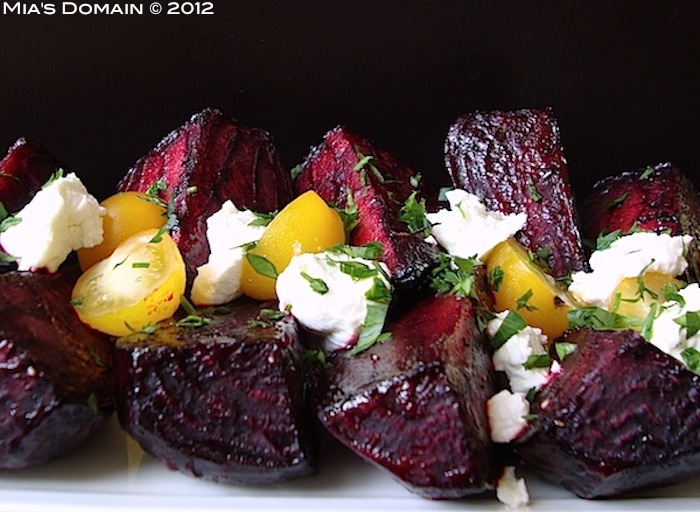 Place beets on a baking sheet and roast for about 20 to 40 minutes or until caramelized and soft. Arrange on a serving platter and drizzle extra virgin olive oil over the top. Garnish with goat cheese crumbles (optional), cherry tomatoes, and fresh herbs. Now that's my kind of cookin'--yum. I love roasted veggies, and roasted beets are at the top of my list... love the beet-garlic pairing here.. Thanks for sharing! I love beets. As you say it really is in how they are cooked. I am constantly urging doubters to give them a second look. Ok...I'm going to give beets another try. I've never liked them -- the strong earthiness of their flavor is unappealing to my taste buds -- but I've never had them roasted, and with all of the health benefits of them, it's worth another shot!